“Rolling out IPv6 services in the new 2016 Fall wireless deployment to University of New Hampshire Residential Network allows student devices to make use of preferred native IPv6 services by default and by-pass more intensive private addressing network translation services. This move is a big win for the students and for the IT infrastructure today, while also laying the foundation for future IPv6 technology and applications. The transition to IPv6 is happening at the precise moment when networks are going through extraordinary changes. Virtualization and containerization, XaaS, next-generation hyper-scale data center, and the Internet of Things (IoT) can unlock unprecedented value for the enterprise. According to Cisco, in less then two years, more than half of all Internet traffic will be over IPv6. An IPv6 migration is imminent. However, to take full advantage of these technologies requires a dedicated IPv6 practice and specialized tool sets most IT organizations lack. Further, as Gartner says, organizations undertaking a large-scale IPv6 deployment are likely to need a DDI platform (DNS, DHCP, and IP Address Management). Now you can reap the full value of IPv6 innovation with Next Level DDI from Infoblox. Our platfrom empowers your organization to implement a rigorous IPv6 practice with an ideal mix of capabilities, tools, and actionable insights. IPv6 provides unlimited unique addressing for the data center, eliminating the need to renumber based on the address scarcity that exists in IPv4. IPv6 can also reduce the need for complicated network overlays or configurations associated with insufficient addressing. It allows for the allocation and assignment of consistently sized and unique subnets with sufficient host addressing, whatever the topology of your data center. With Infoblox, your IT teams can readily understand and manage IPv6 subnets and take full advantage of the unlimited scalability and ease of provisioning that IPv6 makes possible. Your implementation of IPv6 needs to be transparent to customers. They expect the same experience with your website and applications whether their devices are using IPv4 or IPv6. However, IPv6 is not backwards-compatible with IPv4. If you’re not prepared, the translation required between them may cause performance issues or even outages. With Infoblox, you can ensure that customers can access websites and content over IPv6 without disruption or delay, gaining an edge over competitors who are not IPv6 ready. All modern operating systems have IPv6 enabled by default. In fact, it’s a critical component of Windows operating systems and cannot be disabled without jeopardizing Microsoft support. The reality is, IPv6 is already running on your network and your IT teams need to track and manage it. 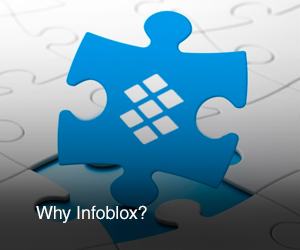 With Infoblox, you can do so with ease—and avoid serious security and compliance risks. Tomorrow’s Internet will comprise tens to hundreds of billions of connected devices. Only IPv6 offers the abundance of IP addresses required to get these devices online to unlock the tremendous business and social value of the Internet of Everything. With Infoblox IoT-enabled solutions, you can support an agile and robust IPv6 practice for compliance purposes and readily provision, track, and manage IoT’s virtually unlimited number of devices.